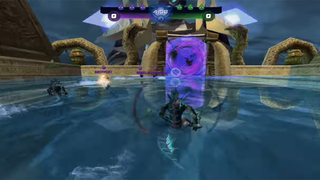 Using themes from WoW, but made with the StarCraft II editor by Bounty, Aqua League looks like fast-paced soccer game with a few funny elements added. It’s something similar to Rocket League but instead of bumper cars it has Nagas and Elementals and it’s for the StarCraft II Arcade. Looks fun, and it’s always great to see when people tweak the hell out of the RTS game’s map editor and create something totally different.